What could be better than a tall, refreshing glass of wine after a long day? A wine cocktail, that’s what! 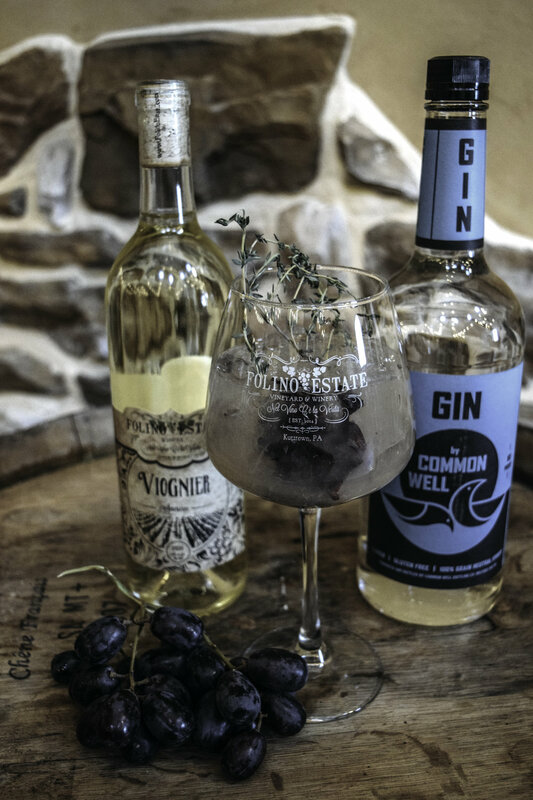 Folino Estate Mixologist Joe Devlin has crafted new, refreshing cocktails with fresh ingredients, top shelf and locally provided spirits, and of course, Folino Estate wines! We invite you to learn more about our new featured cocktails below to try when visiting us, or make your own at home just in time for spring and summer entertaining! Named after the Owners’ eldest son, this powerful and refreshing cocktail boasts herbal notes, and simply, tastes like spring. To not overpower the earthy tones, Joe created a simple blend of gin, lemon juice, simple syrup & basil with lemon wheel and basil leaf garnishments to bring our Lorenzo’s Garden cocktail to life. Fresh, crisp, and perfect for sipping. Join us on our patio and watch the sunset over the vineyard with Lorenzo’s Garden in hand…can you picture anything better? Named after the Owners’ youngest son, Luca’s Garden is the alternative to its older brother. It is more subtle in the herbal notes, and highlights a light citrus taste. A blend of vodka, aperol, zesty lemon juice, simple syrup, topped with our Frizzante Moscato & garnished with an orange wedge and basil leaf, this cocktail would be perfect at your first outdoor get together! A drink so much like summer, you can taste it! Try our other wine cocktails like Cabernet Cosmo, Ciao Bella, Bianco Dolce Margarita, Lorenzo’s Crush, Rose Lemonade, and more at your next wine and dine experience! Join Joe at our Wine Cocktail Class, and try your hand at mixology! Know someone who just moved? This would make an excellent housewarming gift for friends and family looking for new drink ideas to make in their new place! Check out the cocktails we will be featuring in the class… you don’t want to miss this! Click here to purchase tickets. A twist on the classic “Bramble” cocktail originally made with gin in the prohibition era. The defining quality was a blackberry liquor floated on top to create a pleasing visual. As an alternative, our Pinot Noir with blackberry notes better compliments bourbon as opposed to gin. The Negroni is perhaps the most popular Italian cocktail, and has been reemerging in popularity greatly in the bar business. There is an entire week in June solely dedicated to this drink to raise money for various charities. The Rose Negroni could be Folino Estate’s new contribution to these causes. Light, refreshing, smooth, and with grapes muddled in the mix, it suits perfectly for a wine cocktail. ALMOST too pretty to drink! A historic cocktail with a story not many know about. This cocktail was actually served on the Titanic and paired with the main dinner course during its final voyage. Cocktails from this era commonly used egg white to create a frothy texture alongside a sparkling wine. 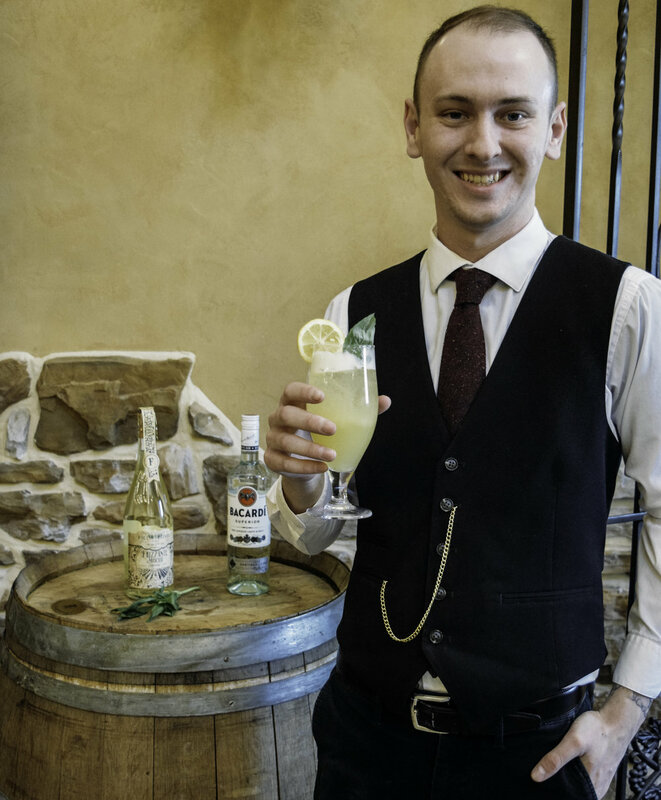 Meet Folino Estate Mixologist, Joe Devlin! Joe has been working at Folino Estate for a little over a year. He has experience working in our Tasting Room, Banquet and Event Bars, and our Dining Room Bar. Joe’s interest in history has helped him become well versed in the stories and histories of liquor, wines, and cocktails. His meticulous attention to detail and natural knowledge of complimentary flavors helps him create one-of-a-kind, delicious cocktails that leave guests raving. Meet Joe and learn about all of the cocktails listed above at our Wine Cocktail Class!